A Guest Post by Nick Rains. Warning – the following is quite advanced (even geeky) and I must assume the reader has a working knowledge of channels, levels, curves, blending modes, tools etc as well as how the main color models work (RGB, Lab, HSB). Much has been written about converting colour to Black and White: we all know that there are a great many different ways to do this, some more effective than others. Differences between the various methods are usually explained in terms of visual appeal or the ability to blend the various colour channels to emulate traditional B+W filters. What has not been mentioned is exactly why different greyscale conversions give different results, and more importantly, the fact that this principle can be used to make more accurate adjustments to colour images. This last point seems quite contradictory; what has greyscale conversion got to do with colour adjustments? Well, quite a lot really when you remember that all RGB colour images are comprised of three different ‘channels’ of greyscale information, each of which represents the lightness values of each of the three colours and that it’s the relationship between them which give us the illusion of ‘colour’. If you alter a colour image by, say, using the dodging or burning tools, you are actually altering 3 greyscale channels at the same time and unless the relationship between those 3 channels stays exactly the same, there will be a shift of hue or saturation which is of course not the aim of the adjustment. Many of Photoshop’s tools, used at face value, operate on a composite of all three channels – not an ideal situation. Photoshop very rarely uses the term Luminosity. It is not Brightness in the Hue, Saturation, Brightness (HSB) colour model. It is not the Lightness channel in Lab mode and it is not the K value when you use the colour picker in Greyscale mode. Luminosity is the perceived brightness of a colour, not it’s numerical or measured value under the above colour models. Look at this image – 3 patches of full strength RGB. Each has a 100% Brightness and a 100% Saturation, all that differs between them is the Hue. However, I think all would agree that the green is perceptually lighter, or more luminous, than the red which is in turn lighter than the blue. So, whilst the numbers show a 100% Brightness, you see quite different tones. Here is the same image converted to B+W using Image > Adjust > Desaturate. 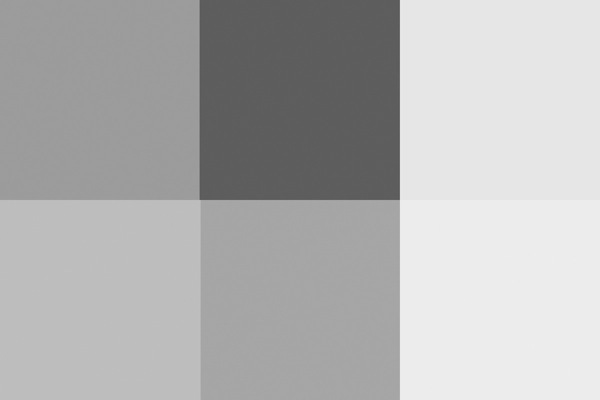 All the colour contrast disappears because the Hue (colour) is removed and the new lightness of the greys in the top row is exactly 50% (127) because the Saturation and Brightness are both equal. Here is the image converted another simple way : Image > Mode > Greyscale. 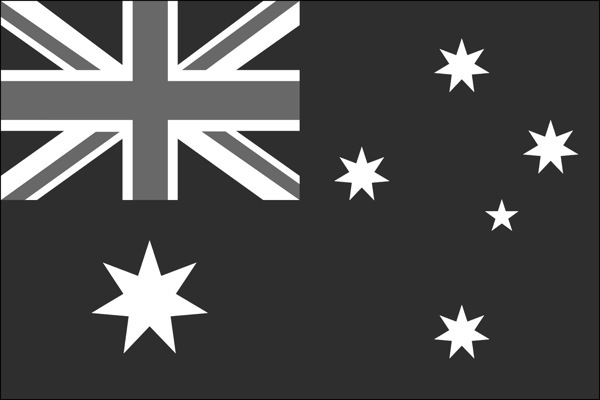 This is better because the conversion is a little more like our eye sees colour with an emphasis on the Green. In fact the colour weighting is very close to 60%G 30%R and 10%B where the Green lightness as double that of the Red, much like our eyes see and tipping a nod to the fact that there are double the number of Green sensels on a camera’s Bayer array as compared to Red and Blue. The conversion still looks a little lacking in contrast however, and good B+W images really need good impact or contrast to look their best. Even the Lightness channel in Lab, shown below, does not really depict the relative tones of the colours as we experience them. It is actually a lot closer to the perceived luminance but is perceptually ‘lighter’ overall than the simple Mode > Greyscale conversion. This gives a slightly more punchy look and it is a good starting point for converting your images to B+W. The Red looks a little dark to my eye, and the Blue a bit dark, but since there is very little pure colour in nature, this combination works well in the real world. So why the fuss? Why do we need to know all these different methods? The point to understand is that when you are removing colour information and having your image rely only on greyscale tones you need to control how those tones relate to one another. Do you want the blue of the sky to become a darker greyscale tone than the green grass? Or vice versa. 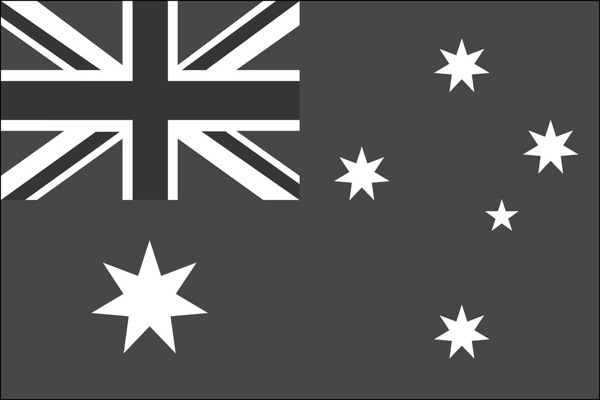 As an example, for the Australian flag – which greyscale version looks better? There is no definitively correct answer – it’s the one which looks best. Personally, I think the one with the darker blue looks best because it maintains the perceived brightness of the blue as well as keeping good contrast between the blue and the red. You need to take control and make sure the colours in the original capture translate to good meaningful contrast in the B+W version. 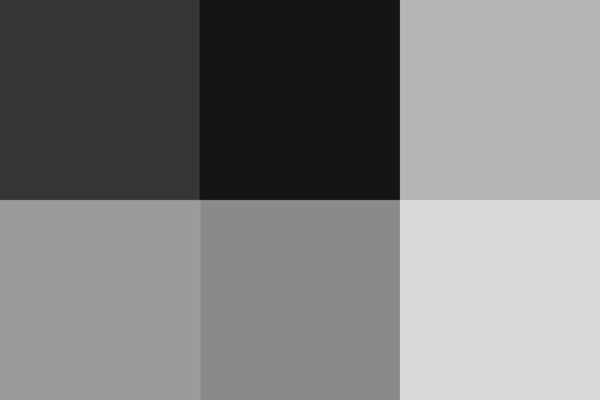 This is the secret of good B+W conversions – not the precise method, but being aware of the tonal distributions and which greyscale value a colour is converted to relative to the other colours’ subsequent greyscale values. What if you duplicated a colour layer and added a monochrome channel mixer adjustment layer to that new layer? You could then change the new layer’s Blend Mode to Luminosity and use the Channel Mixer to adjust the Brightness and Saturation of the colours in the image without affecting the Hue in any way. If you try doing this directly with Curves or Levels you’ll get a small Hue shift as you adjust the Brightness and Saturation. If you don’t believe me try setting the Info Tool to HSB instead of RGB and read off colours as you make a direct Curves adjustment. You’ll see all three numbers change, including the Hue. I’ll discuss this further in a future article. In converting to B+W the green of the jacket and the blue of the cap have darkened whilst the red skin tones have slightly lightened. The face and hands now stand out far better – a good example of a situation where the colours in the original were simply a distraction, adding nothing to the shot, and so were removed. Nick Rains is a Queensland based photographer who has been shooting professionally since 1983 and has seen first hand many changes in the photographic industry, from manual to auto focus in the late 1980s through to the shift to digital in the past decade or so. Nick currently shoots feature work for companies like Australian Geographic and Orion Expeditions as well as writing for magazines and blogs around the world. Nick is both a Canon training consultant and a Leica Ambassador, as well as a Master Photographer with the AIPP and a national judge. You can see more of his work at www.nickrains.com or add him to your circles on Google Plus. For more in-depth photography writing, try Nick’s iPad app “Photique”. It’s a free download. "as long as the photographer gets a result that he or she like, whether it be by carrying out a complicated conversion or using a one-click conversion tool then that is all that really matters"
I wanted to explain how the tools work behind the scenes and why it's important to control the greyscale values of the colour relationships. 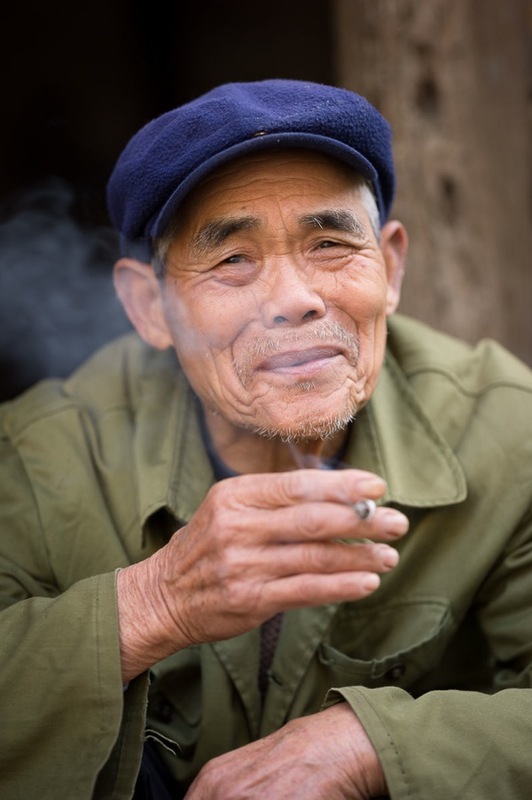 The tools in LR work on a composite of the image colour data, not the individual channels. Channel mixer in PS works on the three basic colour channels individually which is why some adjustment controls have colour 'bleed' and others, like ChMix don't. Sorry, reading my question back I didn't make myself clear. In colour in the HSL panel, you can see the various colours in the histogram. If I reduce the luminosity of, say, the greens then the entire histogram is changed and there is a shift in the position on the histogram of not just greens, but the blues and yellows which are adjacent to green, and there's a knock-on change of the other colours. So, I think that reducing one colour's luminosity must have an effect on the other colours too. Please correct me if I am wrong. This would mean that your method above of converting to B&W and using the channel mixer and blending modes has an advantage over using the HSL mixer in LR/ACR. 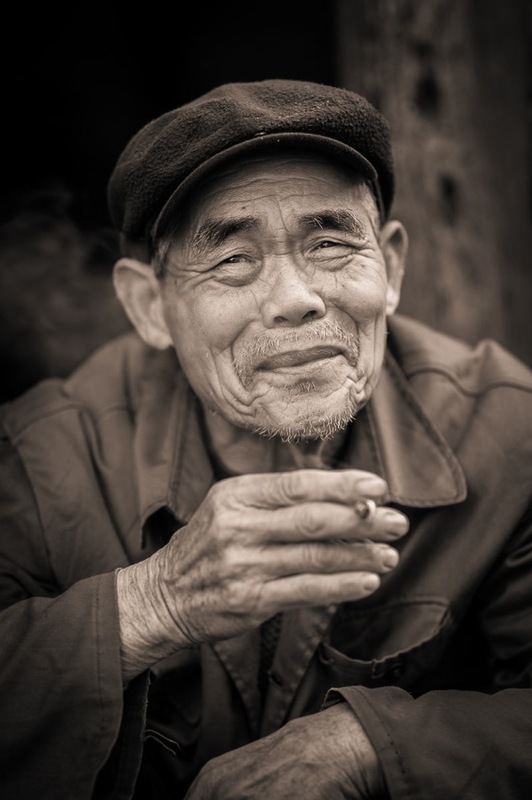 My question was whether there is a similar effect in the B&W panel in LR/ACR. Does adjusting the luminosity of, say, the greens have a knock on effect on the other tones? You suggest not and, having since experimented with a few images, I do agree. This means that I have greater control over a B&W image using the sliders in Lightroom than the channel mixer in CS6. As an aside, I've noticed that setting all of the HSL values to zero and then changing to B&W also set to zero, the overall shape of the histogram changes. This happens even if you have desaturated the image beforehand. Hitting B&W therefore doesn't just do a neutral desaturation but some other processing happens too. I guess this is all fairly academic because as long as the photographer gets a result that he or she like, whether it be by carrying out a complicated conversion or using a one-click conversion tool then that is all that really matters. I do like to see how things work though and it is good to have some extra tools on my belt. Thanks for the tutorial. About time someone gave the nitty gritty on converting to B&W. I'm sick of seeing people convert by hitting a one-click desaturate button, or use B&W to hide otherwise terrible photos. Ivor, in LR/ACR the full set of HSL sliders are for colour images, not B+W; in the B+W controls you'll see one set of sliders for luminance only. I can't see what you are referring to. If I darken the Reds, I see no shift in the Blue tones, which is how it should be. Also, ACR/LR's B+W controls are not the equivalent of Photoshop's Channel Mixer - they are almost the same as the Black+White adjustment but with eight sliders, not six. The difference is that ChMix works on the three primary RGB channels only and B+W in LR works on eight named (but unspecified) colours from a composite of the basic RGB channels. p.s. If you add the free Grant's Tools plugin to Photoshop Elements you get the channel mixer. That's an excellent article and I gave it a go earlier and was really chuffed with the results. Thank-you! I tried and cannot seem to get the same results using the HSL panel adjustments in Lightroom/ACR. Do the luminosity adjustments in ACR affect other other colours? I didn't think it should. Athough I can understand adjusting, say, red might have a knock on effect on the adjacent secondary colours, reducing the luminosity of just red seems to change the entire histogram. Even the blues get darker. Very odd. Kirk, a good point. Although most programs do have an equivalent to either Channel Mixer or B+W Adjustments. You just need to find some tool that allows you to convert to monochrome using colour proportions like I described. Elements certainly can do this as can Aperture, Lightroom, Pixelmator, GIMP (I assume) etc. The difference lies in the power and access to the different colour models - HSB, LAB, CMYK etc. It's hard to know how B+W 'in camera' works exactly as there is nothing published beyond the Red Filter, Green Filter titles of the various camera monochrome settings. These do not just remove colour like DeSat might, but prioritise different colours so that the Red Filter will give you nice dark skies and the Green Filter will lighten foliage. Not sure about Nikons but for Canons you can concoct your own Picture Styles in the Picture Style Editor and create your own in camera B+W mixes. Best of all, this only affects JPEGs so if you shoot raw you can have your cake and eat it. It would be nice to see this translated, not to simpler-to-understand terms, but for those who do not have expensive programs such as Photoshop or Lightroom. How does one get a better handle on this process when not equipped with the more detailed computer programs? Are B & W programmed settings embedded in cameras these days able to think like this, or do they just kill saturation flat out? I know that when I decide to convert an image to B & W that it takes more than just REMOVING color from the image. I've actually liked the results I've gotten using simpler editing programs than those mentioned above, but it's followed a different formula each time on a photo-by-photo basis. I often convert from colour and have sometimes been missing the level of control detailed here. And Nick, it is advanced but really clearly explained, so thanks for that! Thanks for the tips. I had some training in how to manipulate color images like a pro but never did get to take the class for b/w. This will help. Thanks.